New marketing trends data from MerchantCircle's 7th survey of small business owners across the U.S. reveals that group deals are gaining popularity among small businesses and shows Google Offers and other niche deal providers are putting increased pressure on Groupon and LivingSocial. There’s also evidence of slowing adoption for Facebook Ads, although favorability for this new advertising medium remains strong among those who are using it. 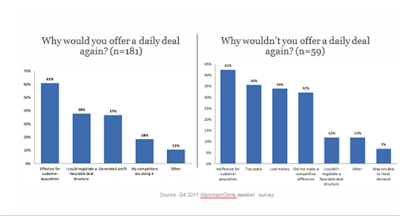 Nearly 12 percent of local merchants now report having offered a daily deal, up 33 percent since the last MerchantCircle survey in June 2011. About 75 percent of respondents say they would offer another deal in the future, citing its effectiveness for customer acquisition as their top reason (61 percent). Deal profitability also appears to be on the rise: 37 percent now say solid profitability will lead them to offer another deal, up from just 24 percent in June. Among the 25 percent who said they wouldn’t offer another daily deal, 42 percent said it was not effective for customer acquisition, 36 percent said it was too costly and 34 percent said they lost money on the deal. 2. Cost is the most important criteria for selecting a deals provider. 64 percent citing cost as their top consideration when selecting a deals provider. Local targeting (57 percent) and the ability to reach a large audience (52 percent) were the second and third-most important selection criteria. Businesses that plan to use Groupon in the future report that the ability to reach a large audience is equally as important to them as cost, with 62 percent citing reach and cost as key selection criteria. 3. Groupon and LivingSocial may face increased pressure from Google Offers in 2012. About 19 percent of local merchants who have offered a group deal have tried using Google Offers since its launch this summer, as compared to Groupon (26 percent) and LivingSocial (21 percent). A large number of specialized deals providers have also entered the market; these services have been used by about 43 percent of local merchants who have offered a group deal. 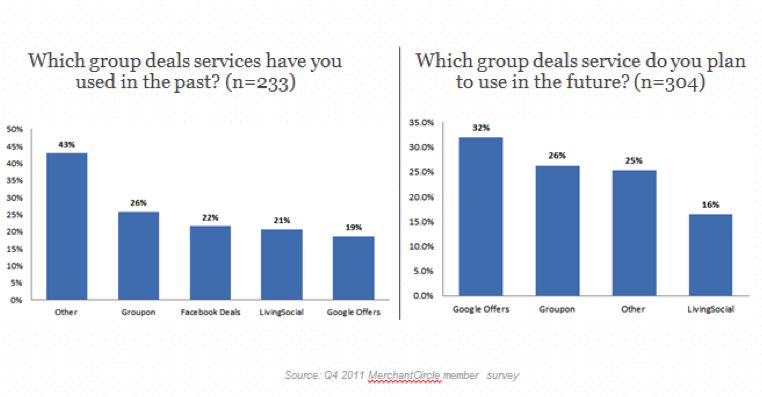 About 32 percent of merchants planning to use Google Offers for their next deals, as opposed to 26 percent who plan to use Groupon and 16 percent who plan to use LivingSocial. Google Offers enjoys the highest retention rate of all the large deals providers: 66 percent of its customers plan to use Google Offers again. Just 41 percent of Groupon and LivingSocial customers report that they plan to use these services again. Before ceasing operations, Facebook Deals had been used by 22 percent of the respondents who’d offered a daily deal in the past. 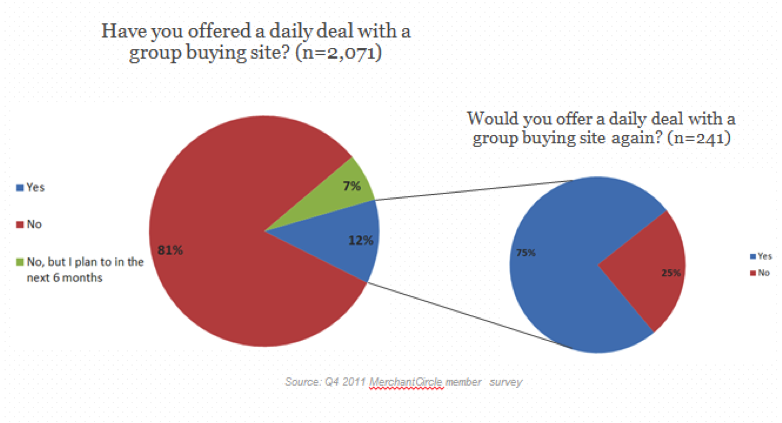 More than half of these customers say they plan to use Google Offers for their next deal (53 percent). 4. Facebook Ads growth slows among local merchants. About 23 percent of local merchants report having tried Facebook Ads to date, which is only five percent more than six months ago. 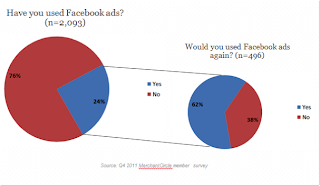 That being said, favorability for Facebook Ads remains strong among those who have tried them, with 62 percent saying they would use Facebook Ads again, citing ease of use (62 percent) and the ability to start and stop campaigns (55 percent) as the top reasons for continuing. 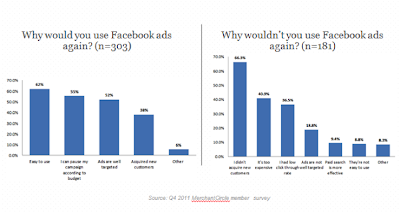 Of the 28 percent who say they wouldn’t use Facebook Ads again, nearly two-thirds report that they didn’t acquire new customers (66 percent). But more merchants now also cite high costs and low click-through rates as reasons not to advertise with Facebook again: 41 percent of merchants said the ads were too expensive (up from 35 percent in June) and 37 percent reported low click-through rates (up from 29 percent in June). While Facebook Ads growth may have slowed, general Facebook marketing continues to be extremely popular among local merchants, with 70 percent of people using the social network for marketing, up from 66 percent in June. A big THANK YOU to all our merchant members who participated in the survey. Stay tuned for more insights into small business marketing in the coming days! I can only speak for myself, but in these ahrd times cost is the factor. I need to be able to justify any costs associated with lead generation.